One Mom's Moxie: Are You a Clearasil Mom? Read How I Became One! I participated in an Influencer Activation on behalf of Influence Central for Clearasil. 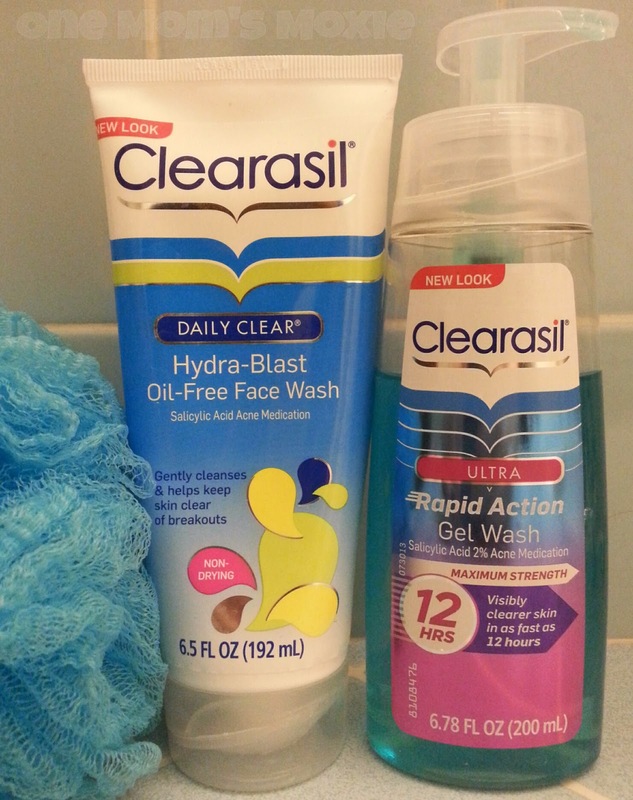 Recently I was sent two Clearasil products for my teenage daughter, Kaylen, to try out. Since I wouldn't let her test these alone, I gave them a try as well. They were the Clearasil Ultra Rapid Action Daily Gel Wash and the Clearasil Hydra-Blast Oil-Free Face Wash. The Ultra Rapid Action Daily Gel Wash is formulated with maximum strength acne medication and gives you visibly clear skin in as little as 12 hours. The Hydra-Blast Oil-Free Face Wash helps reduce breakouts up to 85% in about 4 weeks. It is formulated with a moisturizing complex to help your skin feel soft. We were both not sure how well the Clearasil face washes were going to work. My daughter has breakouts about once a month, sometimes twice, it just depends on what is going on around her. I also have some acne occasionally, so I was happy to try the Ultra Rapid Action Daily Gel Wash.
Kaylen has now been using the Hydra-Blast Oil-Free Face Wash for almost 3 weeks. During the first week she wasn't happy, but she had also used both the Ultra Rapid Action Daily Gel Wash with the Hydra-Blast. She now uses the Hydra-Blast Oil-Free Face Wash daily. So in the beginning she noticed a big breakout, I reassured her that this happens and that the wash was cleaning out her pores. Her face was also dry and just slightly flaky. Now she is getting better, the Clearasil wash is still working to clear up her face but it is noticeably softer. Kaylen really likes that the Clearasil wash is easy to implement into her daily routine, it's one quick thing that can be done even after her second PE class. Hopefully she'll let me take a photo of her after the full 4 weeks are over to share her results. I'll keep you all posted! I have tried both products but not on a daily basis, yeah I am really bad about skin care. I did like that the Hydra-Blast Oil-Free Face Wash made my face feel smooth and soft afterwards. It has a creamy texture and is very easy to use. When I used the Ultra Rapid Action Daily Gel Wash I noticed it seemed stronger and gave my face that clean, fresh feeling. I didn't notice a difference in my acne for either one, but I only get a few blemishes here and there. Overall, I am happy with the results and I'm now a Clearasil Mom. I truly believe that if Kaylen sticks to using the wash daily that she will notice a big difference in another week or two. I like that both these washes come in containers that she can take with her on a sleepover or just about anywhere. If you have a tween or teen you should at least look at the Clearasil site to check out their awesome products! You can also follow Clearasil on Facebook & Twitter.